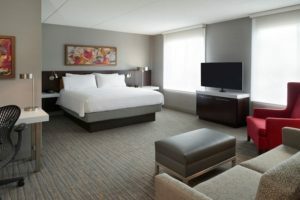 Renovations of the guestrooms and public spaces at the Hilton Garden Inn Toronto Airport West/Mississauga are now complete, reports Atlific Hotels. Robert J. Chaban & Associates designed the refreshed spaces. Renovations to public and private spaces comprise new furnishings and carpet, enhanced lighting elements, new paint and garden-inspired artwork that has brightened the lobby and added texture to meeting rooms. Geometric floor-to-ceiling curtains made from a dimensional fabric that shines thanks to unique lighting fixtures hanging in the middle of the entrance are a highlight of the lobby revamp. Another highlight of the renovation is the new Garden Room, an enclosed boardroom with a serene ambiance. It features new furnishings and carpeting, window treatments and a television. The property has a total of 3,500 square feet of meeting/event space, which accommodates groups up to 300 people. Set in the heart of the Mississauga Business District, the hotel is a nine-minute drive to Toronto Pearson International Airport. Other amenities include a business center, 24-hour Pavilion Pantry Market, fitness room and pool. Atlific Hotels is one of the leading hotel management companies in Canada operating over 60 hotels with offices in Montreal, Toronto and Vancouver. Its parent company, Ocean Properties Hotels Resorts & Affiliates, operates over 70 hotels throughout the United States. Together they manage over 130 properties in North America with over 20,300 rooms, which include independent hotels and resorts as well as internationally recognized hotel brands such as Marriott, Hilton, Westin and Holiday Inn.